Seasonic sends out word that it has eight new power supplies with 80Plus Platinum rating. It includes the fanless 400W, 460W and 520W models, as well as 660W, 760W and 860W models with a large fan. On top of that, Seagate is also working on 1000W and 1200W models, which should arrive soon. The launch of the Seasonic Platinum series has achieved great success last year. The fully modular Platinum-860W and Platinum-1000W power supplies have won numerous accolades and became standards of excellence for the 80 PlusR Platinum design throughout the entire industry. Seasonic has upgraded The X-400 and X-460 Fanless models from 80 PlusR Gold to 80 Plus Platinum, and a new 520W Fanless model also joins the Platinum family. 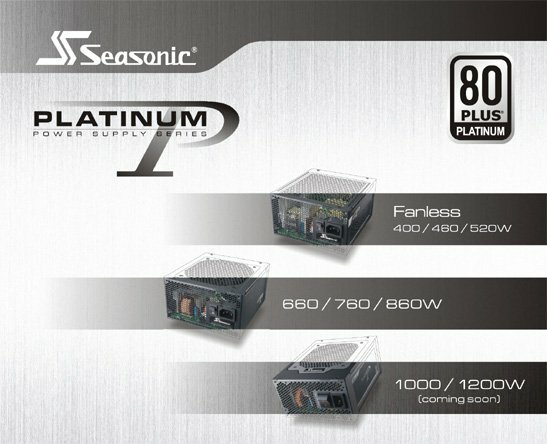 Sea Sonic’s highly efficient power supplies in the Platinum 660W to 1200W range are top performers that at lower loads can operate absolute silently in semi-fanless mode. As an additional feature, all these units are equipped with a selector switch that enables users to choose between traditional fan control (S2FC) and semi-fanless mode (S3FC). This sophisticated S3FC design ensures that the fan will only start spinning at loads greater than 30% of the maximum load. All the Seasonic Platinum Series power supplies utilize top quality components, such as gold-plated high current terminals and Japan-sourced 105? aluminum electrolytic capacitors, which contribute to high performance, reliability and extended product lifetime. Sea Sonic is committed to high quality and stands behind its products by offering 7 years warranty for all the units in the Platinum series.